Treason? Communist Party USA Prepares to Defend China Against US in Event of "Confrontation"
The Communist Party USA is preparing to defend China against the US, in what it sees as a looming Washington/Beijing "confrontation". While long a loyal ally of the Soviet Union and later the Communist Party of the Russian Federation, the Communist Party USA has also become markedly pro-China in recent years. As Moscow and Beijing have openly moved into a military and economic alliance through the Shanghai Cooperation Organization, the American Communist Party has also staked out a pro-China position. Now Communist Party USA members are discussing how to help China, in the event of Washington/Beijing hostilities. 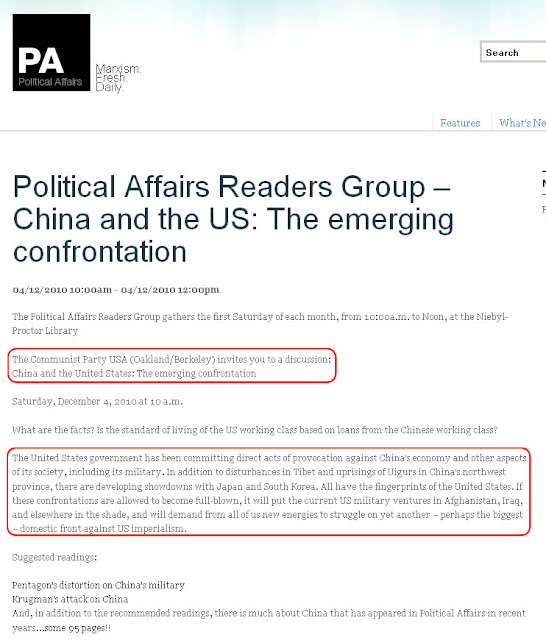 Political Affairs, the theoretical journal of the Communist Party USA is currently advertizing a December 4 meeting at Berkeley's Niebyl-Proctor Marxist Library - "China and the US: The emerging confrontation". This is the key paragraph. The United States government has been committing direct acts of provocation against China's economy and other aspects of its society, including its military. In addition to disturbances in Tibet and uprisings of Uigurs in China's northwest province, there are developing showdowns with Japan and South Korea. All have the fingerprints of the United States. If these confrontations are allowed to become full-blown, it will put the current US military ventures in Afghanistan, Iraq, and elsewhere in the shade, and will demand from all of us new energies to struggle on yet another – perhaps the biggest – domestic front against US imperialism. Note the phraseology - "The United States government has been committing direct acts of provocation against China's economy and other aspects of its society". This is reminiscent of the Communist line of decades past which accused the US of waging "wars of aggression" in Korea and Vietnam, even though both wars were sparked by communist invasions. This language is designed to condition US communists into loyalty to Beijing, by painting the US as an aggressor in any future hostilities - even if China strikes first. The message will be: "China only attacked in self defense. The US shouldn't have pushed China. China only wants peace. Workers must defend China against US aggression." If these confrontations are allowed to become full-blown, it will put the current US military ventures in Afghanistan, Iraq, and elsewhere in the shade, and will demand from all of us new energies to struggle on yet another – perhaps the biggest – domestic front against US imperialism. What does this mean? It is a clear signal that US "comrades" must prepare to act as at least a propaganda and activist "Fifth Column" for China, if and when conflict breaks out between Washington and Beijing. Will this escalate to full blown treason, should a shooting war start? The Communist Party USA's own disloyal history suggests it would. "In his opinion there was no room in America for those who were part American, and part something else." "I do not want Americans of foreign birth making their party alignments on what we mean to do for some nation in the old world. We want them to be Republican because of what we mean to do for the United States of America. Our call is for unison, not rivaling sympathies. Our need is concord, not the antipathies of long inheritance." We already have Congressmen worrying about protecting the rights of illegal aliens, why not protect China's interests over our own. Every confirmed traitor should be taken in front of the Liberty Bell & executed, for numerous reasons. Glad they are finally showing their hand... they LIED to get in power and now will go DOWN by admitting the truth of their ideolgy...They are going to be SHOCKED and AWED that MOST Americans still LOVE this country, and our FREEDOM..
this time,,, when we jail them for treason,,, we will NOT let them go on technicalities..
"Nations" are founded upon principles of "unity". This country is no exception, our Founders founding "formula" for this "nation" is found in the 2nd. Federalist Paper. They founded this country for "Ourselves and our Posterity" alone, not the entire human family, consistant with the "legal" definition of "nation". The various "non-posterity" American minorities were adopted into the mainstream "host" body politic after-the-fact after the Civil War. Those accepted and adopted into our national family were required to take an oath of alliegance to our Constitution and to the founding principles laid down by our Founders. This country was not founded for them, they have been invited in ipso-facto. As guests in the house of the "posterity" host, they are expected to recognize, respect, and abide by the rules of the house as have been established by its "host". They have no right to assimilate into our "family" availing themselves of our hospitality and generousity and then demand that we abandon and abolish our founding principles to accomodate their alien customs and beliefs. They are expected to become "Americans" and adhere to a common and unified ideaology. Our Founders were not Marxists, they did not establish a generic game refuge welfare state to accomodate freeloaders. They founded a free society for people who wished to live in freedom. Marxists do not belong here, this isn't their country. Their presence here is like a virus in a computor, now demanding a right to exist inside the host it has infected. Unless the virus is eradicated, the computor will be destroyed. Warms my heart to read these sentiments. If you guys don't know of Golitsyn, or have read Nyquist, I recommend you go check them out. Loudon has Nyquists site posted in his link section. Also read "Once Upon a Time in the West". Read Golitsyn and spread the truth. Thanks to men like Loudon and Beck, this country is closer than ever to waking up to the truth of the perestroika deception.